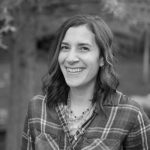 Hello Lil’ Luna readers! It’s me Natalie, from Life Made Simple. 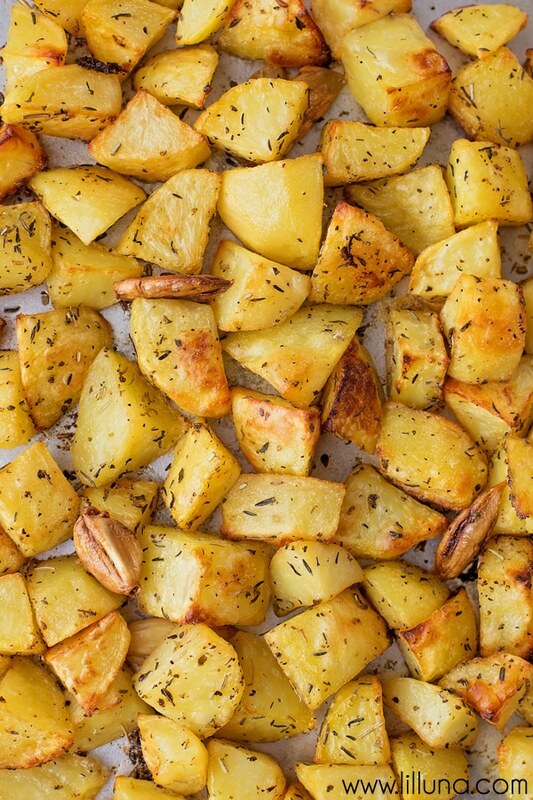 Today I’m sharing a really effortless side dish idea- easy herb roasted potatoes. I’m constantly trying to come up with new ideas for side dishes. Our family gets so tired of eating pilaf, butter noodles and mashed potatoes. This is a really flavorful and simple solution! The best thing about this recipe is that all of “active” time for this recipe is the prep work. Peeling and chopping the potatoes, boiling them and tossing them in the lemon/herb/oil mixture. And that only takes about 10 minutes. I’m telling you, these potatoes are a cinch to make!!! All that’s left to do is spread the coated potatoes onto a hot baking sheet and bake at 375 degrees for about 1 hour. Turn every 20 minutes and you’ve got a pan full of bright, herby golden potatoes. If you’re looking for a delicious and simple side dish to try out, you’ve gotta give this one a try! 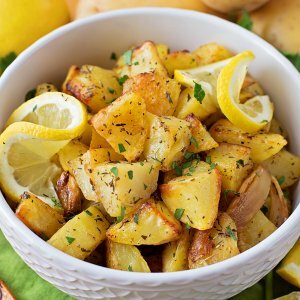 I LOVE, LOVE, LOVE potato side dish recipes, and these Lemon Herb Roasted Potatoes look delicious! For more amazing recipes from Natalie, head to Life Made Simple. 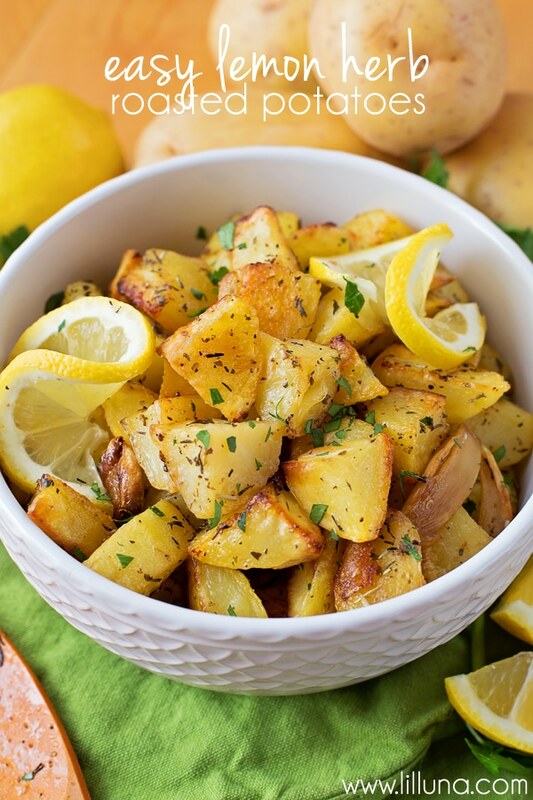 Easy Lemon Herb Roasted Potatoes - A yummy side dish!! 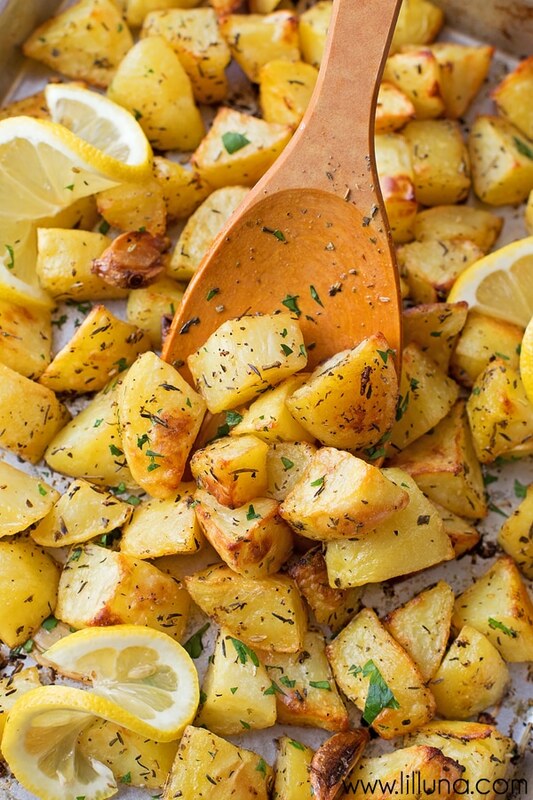 Golden potatoes in lemon juice, olive oil, and lots of seasonings!! Preheat oven to 375 degrees. Place a baking sheet or 9x13 inch pan into the oven and bring it to temperature while the oven preheats (you want it hot). Meanwhile, boil the chopped potatoes in lightly salted water for about 5, drain and toss into a large mixing bowl with the lemon juice, olive oil, salt, pepper, garlic powder, oregano, thyme, rosemary and garlic cloves. Pour the coated potatoes onto the hot baking sheet or into the baking dish and bake for 1 hour, tossing every 20 minutes to get an even brown on all sides. These were a great complement to a Greekish dinner. I would bake them for an hour and 15 minutes next time, to get them really soft on the inside and crispy on the outside. Thanks for a good recipe! You are so welcome!! Thank you for trying them!